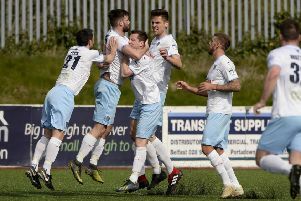 Mark Magennis, pictured here playing for Harland & Wolff Welders against Ballymena United in the Irish Cup this season, and Gary Thompson will be team-mates at the Showgrounds next season. Picture: Press Eye. Ballymena United manager Glenn Ferguson says he hopes to add “a couple more” signings after the captures of Alan Blayney and Mark Magennis. Ferguson has moved quickly to snap up former Northern Ireland keeper Blayney from Glenavon and Harland & Wolff Welders midfielder Magennis, both on two-year deals. “The two signings happened pretty quickly but I’m delighted to get both players,” Ferguson told Times Sport. “It looked as though Alan was on his way to Crusaders but we got in quickly - I was disappointed not to get him last summer so I’m pleased we’ve finally got it over the line. “Mark Magennis impressed against us for the Welders in the Irish Cup for each of the past two years but his signing isn’t a knee-jerk thing. “We’ve had him watched half a dozen times and he has impressed. He offers us something different - he’s good on the ball and he’s street-wise on the pitch. “People talk about his physique but I spoke to Gary Smyth at the Welders who told me that Mark never misses a night’s training and he is very good at getting around the pitch. “There have been plenty of players who have played at the highest level who haven’t been the most athletic-looking but they have bags of ability. “There’s an element of risk with any signing - we have signed a number of Premiership players in the past who haven’t worked out,” added Ferguson. “We’ve already seen that most of the transfers that Premiership clubs have made so far have been players from the Championship because it’s such a competitive market with clubs all competing for the same players if they become available. “We would like to try to get a couple more players in, but we’ll see how it goes,” added Ferguson. Magennis won’t be immediatley available to Ferguson at the start of the new season - he will have to serve a suspension after being sent off for the Welders in their Intermediate Cup final defeat by Carrick Rangers.